From the author of New Vegas' most popular companion mod, Willow - A Better Companion Experience, comes a new, complex companion for Fallout 4. Heather is a story-driven character with over 1200 lines of custom, voiced dialogue, quests, etc. 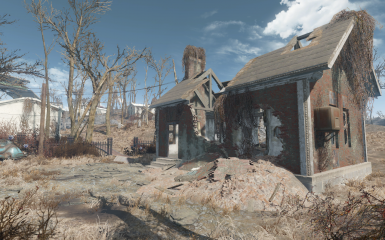 Heather's unique implementation is designed to improve on the FO4 companion experience. A Different Sanctuary needed only for a terminal I used but great mod. Heather Casdin - The Girl out of my league You need this mod or mine is pretty much going no where. 1) You do not have permission to upload my content to another site on Nexus or elsewhere. 2) You may not modify my file for upload without prior permission if the scope of what you want to do exceeds a simple compatibility patch. 3) You do not have permission to upload my content for use with another game. 4) You do not have permission to use the assets used in this mod in your own work. 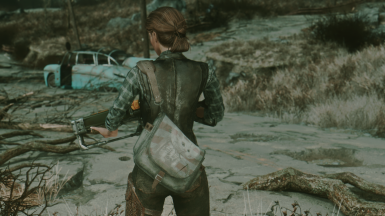 If you would like to create a patch for Heather to work with another Fallout 4 mod please feel free to do that without seeking permission as long as you do not include the Heather esp/assets in your upload. I do not grant permission for that. Please send players here to get the original Heather download and please give credit to me as the original author. Please do let me know if you create a patch so I can 1) tell players about it and 2) answer questions intelligently when players come in asking about it (which they will). I've borrowed the following assets to create Heather's looks. Thanks to all these authors for freely sharing their work. 2) Ponytail Hairstyles by Azar v2.0; Requestedpermission which was granted. If you are updating from a previous version be sure to delete the previous version before you install the new one. See ReadMe in download or in the Changes tab on this page to see what's been done. Read the changes made to the mod. I've added new content and changed some things and how they work. It's a must read if you don't want to be surprised, frustrated or confused when you play the new version. The changes are in the ReadMe in the download or above in the Changes tab.My official position about updating to v1.0 or above is that you should not install it into a gamesave that had an earlier version of Heather in it. The changes I've made are substantial and fundamental. I could not support such an install if there were bugs, etc. If you insist on updating into an existing save, dismiss/rehire Heather. Remember, though, I will be unable to support bug reports in these gamesaves. Most things that go wrong will be with her AI and that kind of thing isn't fixable in the console. Edit:DO NOT UPDATE TO V1.03 FROM A PRE 1.0 VERSION. I'VE BEEN FLOODED WITH COMMENTS BY PLAYERS WHO'VE DONE IT AND THEIR HEATHERS ARE COVERED IN BUGS. YOU'VE BEEN WARNED. ALSO, I AM NOT TELLING YOU TO UPDATE TO V1.0 OR HIGHER. IF YOU HAVE A CHARACTER YOU WANT TO CONTINUE PLAYING AND DO NOT WANT TO START A NEW CHARACTER JUST TO UPDATE, THEN DON'T DO IT. WAIT TO UPDATE UNTIL YOU DO START A NEW CHARACTER. 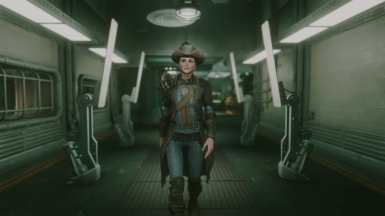 From the author of New Vegas' most popular companion mod, Willow - A Better Companion Experience, comes a new, complex companion for Fallout 4.Heather is a caravan trader who grew up in the Commonwealth. She hates and distrusts synths, wishes she lived before the war when everything was nice, believes in aliens and has heard that pre-war donuts were delicious. Heather is a complex companion similar to the vanilla companions in concept with over 1200 lines of custom, voiced dialogue that is delivered during quests, in specific locations, in random chatter and in conversations with the player and other NPCs.Heather has a tragic past, like most everyone else in the Commonwealth, and when you meet her she still feels that loss acutely. By completing thequest Sweet Revenge you will help to heal her wounds letting her move on with her life. As time goes on her history will be revealed to you through conversations, general chatter and terminal entries. WHERE DO I FIND HEATHER IN THE GAMEWORLD? A radio quest will trigger a few minutes after you leave the vault/start the game with the mod installed. That quest will guide you to her location. The radio quest is not necessary/needed for you to interact with Heather. However, if there is a conflict in your load list the radio station may not play correctly. If it fails you can go straight to Heather and you will be able to talk to her and take her with you. See the image of the Pipboy map for her location. DO I NEED TO START A NEW GAME TO PLAY HEATHER? No, you do not need to start a new game to play with Heather. She has content for quests as early as going to Concord to save Preston, but she'll have comments whether you take her with you or not. She has comments for locations around the game world, so if you have a character at a very high level she'll still have dialogue content for you as you travel around in addition to her quest content. You will miss out on main quest or side quest dialogue content, but if you like her you could always take her along on your next new character to see that stuff. 3. Her default outfit has Ballistic Weave and provides +30 AR and +30 Energy Resistance. 5. She hacks Novice level terminals. You can train her to hack more difficult terminals by telling her to hack a terminal via the command menu. Her skill levels as she uses it. Every five terminals unlocked moves her up a skill level. Once an hour when she hacks a terminal you get +15 affinity points. She will have 100% success hacking a terminal she is trained to hack. -She has four levels of the Sneak perk and doesn't affect the stealth meter. -She is affected by the Inspirational perk and by the perks given by Live & Love. Lone Wanderer works for the player even when she's following. -Her default running speed is much higher than vanillas and closer to the player's sprinting speed. -She doesn't suffer damage when she takes a fall from high locations.-She actually stays where you tell her to stay. -The PA she wears doesn't degrade. And she has infinite ammo for any weapon similar to how it works for settlers. Both of these options can be turned off in the terminal in her bunker (you gain access to the bunker at 250 affinity). HOW IS HEATHER DIFFERENT FROM THE VANILLA COMPANIONS? DOES HEATHER HAVE HER OWN QUESTS? Heather has three quests for the player. Heather gives the player a list of 18 locations she'd like to visit. This quest cannot be completed until after the player has reached Level 20. Requires some of the Main Quest be played through and her affinity cannot be maxed until it is completed. Does not trigger for players that have completed the Main Quest until you reach 500 affinity points with Heather. See Articles tab above if you need some ideas of where to find lots of Gen 1 and Gen 2 synths in the game. This is her affinity quest, however it will never leave your Pipboy quest log. Her location marker is run through this quest as well as other events that happen throughout the life of the mod, as well as most of her dialogue. NEVER RESET THIS QUEST IN THE CONSOLE. HOW IS HEATHER'S GAMEPLAY DIFFERENT FROM THE VANILLAS (not dialogue)? 1. She reliably stays where you tell her to and won't leave that spot ever. She will wander from the spot a short distance, but she will not follow you through load screens, etc. 2. 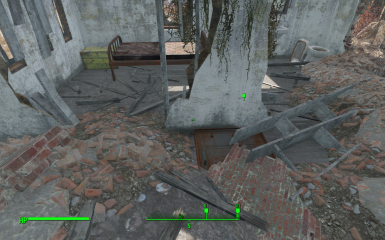 She won't automatically sandbox while following you EXCEPT if you are in a settlement or workshop. There she will wander around and use idle markers, furniture, etc. She'll do this in any workshop or settlement, even modded ones, if they have the right keywords on the location. 3. She has three combat styles you can set in her dialogue menu. a- Vanilla Aggressive is the combat style the vanilla companions use by default. She'll fight anything, anytime. She won't care if you are sneaking or not. b- Vanilla Defensive will create a more timid combat performance. She'll be less aggressive about entering fights, although whether you are sneaking or not still doesn't affect her willingness to fight and she'll run away if an opponent is out of her league (calculation done by the game). I don't find it to be all that different from Vanilla Aggressive except that she will flee combat. c - Enhanced Sneak is an attempt to shut down any detection/aggro on her at all when the player is sneaking and to only turn that back on if the player has been hit/isn't sneaking. She won't run away from combat like she does in Vanilla Defensive and she won't attack everything without restriction like in Vanilla Aggressive. If you sneak she won't attack until you are hit or you stand up. While in this mode Heather takes zero damage outside of combat. 4. She does not spam the player with messages about what you're doing. There will be zero, “Heather liked/loved/disliked/hated that” messages because, "llama hates that." If Heather has an opinion about something going on in the game you will hear it in a comment or conversation. 6. She has a permanent marker showing her location. 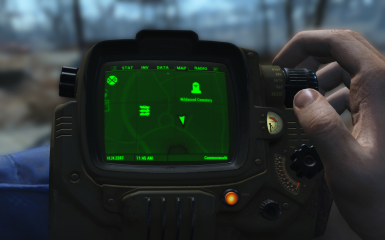 You can see it by choosing the quest, "A Promising Partnership" in the Pipboy and looking on the map for her marker. 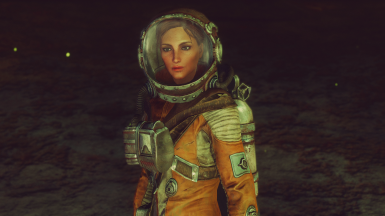 Her current set of Power Armor will also have a marker in this quest. 7. She can be permanently fired. Doing this will shut down her quests, remove perks from the player, etc. However, even though she will no longer be actively present in your game as a character, you should never delete the mod if it is present in your current gamesave. You’ll destroy your gamesaves doing that. You should never do it with any mod. 8. Heather cannot be sent to a settlement as a regular settler. When you fire her before you've reached 250 affinity she'll return to the spot where you first found her. After 250 she'll go back to the bunker. Once you've maxed affinity with her you can build, "Heather's Chemistry Station" at a workshop and she'll go to there when dismissed. 9. She gives you a transponder to carry. 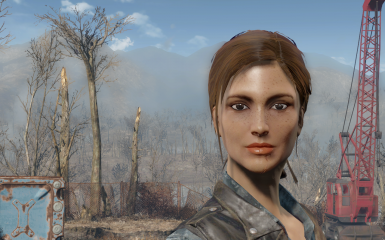 When you turn it on (highlight it in your Pipboy inventory (it’s located in the same section as chems)) she'll come to your location. If you don't have one in your inventory you can craft one at the Chemistry Station. You can use this if she's been fired. USE THIS TO RESET HER AI IF SHE IS ACTING FUNNY (not following properly, etc). 10. 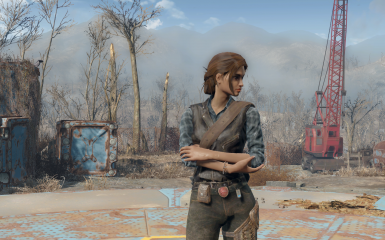 Like the vanilla companions she will not follow you into the Institute except during the end of the main quest. Once Sweet Revenge is complete, however, you can choose to use the transponder to bring her into the Institute with you. 11. Her store inventory resets every three days. Heather carries unique alternative medicine products and scrap in her store. 12. You can set her follow/sneak follow distance in her settings menu (near, medium or long). Default is medium. She will sneak at the same distance you've chosen. So, choose near and she will both sneak and follow near, etc. 13. If you are playing in Survival mode Heather will not cast Lover's Embrace when you sleep with her. Instead she will cast "Heather's Embrace" which increases XP +5% and lasts for 12 hours. This is meant to supplement the Well Rested perk you get in Survival so that the effect is equal to what you'd get if she did indeed cast Lover's Embrace. This is a workaround I had to do because she is built outside of the vanilla companion system and doesn’t automatically cast Lover’s Embrace like the vanillas do (or companions built with that system). 14. Her affinity with the player progresses in bit differently from the vanillas and you do not need Charisma to successfully progress through her affinity quest. As time goes on she likes you more and conversations reflect that.15. She doesn't count as a companion in the game so you can freely hire your allowed vanilla companion with no issues. -No one is in love at this point; if you sleep with her it's not an exclusive or serious relationship. No one says the word love. -You can stop here if you want. A Promising Partnership is never removed from your Pipboy because it houses her permanent location marker and other things that can happen at any time during the game. If you do nothing more to increase her affinity you could stay at this stage with her forever. NEVER RESET 'A PROMISING PARTNERSHIP' IN THE CONSOLE. HOW DO I TRACK MY AFFINITY PROGRESS WITH HEATHER? 1. Two messages should appear whenever Affinity Points are awarded. One tells you what happened that earned the affinity award and how much was awarded and one that tells you the current affinity point total. 2. There's also a dialogue topic in her settings menu that you can use to see the current affinity point total. That exists until her affinity is maxed out. Affinity is capped; you stop accruing points when you reach 1250. HOW DO I LOSE AFFINITY WITH HEATHER? You don't.Heather is isolated from the rest of the NPCs in the game so has no proper faction to protect. She's got nothing against chem use or drinking. She wishes she could have lived before the war and can understand, once she knows what's going on there, that the Institute is a hot bed of technology and pre-war luxury. Also, she's kind of blood thirsty. She enjoys killing Raiders, doesn't care if you kill the NPCs at the Drumlin Diner, etc. However, she isn't against the player doing good things either because she assumes that's why the player helps her. She'll tell you if she has an opinion about something you've done. DOES HEATHER'S DIALOGUE WORK LIKE THE VANILLA COMPANIONS? Heather's dialogue menus are similar to the vanillas. She has the command menu (trade, stay, follow, cancel) and further dialogue menus. However, those further menus contain different topics. She doesn't have a dedicated "Relationship" or "Thoughts?" topic, for example and instead has a Barter topic and one topic for talking to her about other things entitled, "Chat With Heather." Feel free to explore her menus so you become familiar with them. 1. She never force greets you. When it's time for an affinity (or other quest)conversation you will get a quest objective to "Chat with Heather" which is a dialogue option in her menu. Choose it to get that dialogue. It will be lit up when you have a convo waiting for you. When there is no quest objective dialogue in that topic, she will periodically have other things to say. It will be lit up whenever there is something new to talk about. 2. She has a tactics menu where you can set her following distance to short/medium/long (default is medium and controls the distance of both sneak and regular following) and where you can set her combat style (Vanilla Aggressive, Vanilla Defensive or Enhanced Sneak). Default is Vanilla Aggressive. 3. She has some comments in the game world where the vanilla companions do. If you travel with more than one companion you will not hear all comments from all companions. First companion to the trigger usually gets the comment. She does not comment everywhere they do. She says something when whatever's happening is interesting or relevant to her. 4. I've scripted comments to play during quests or in locations and she has a lot of random chatter about those things too. She comments on some holotapes you listen to, but not all of them. She has conversations which play randomly with several other actors in the game. You may hear her talk to some of the caravan traders or Mama Murphy and until you've completed Sweet Revenge she will talk to Cricket.She talks to several of the companions (Cait, Danse, Deacon, Hancock, MacCready and Piper have the most interaction with her). She is NOT mean to Nick and is okay with him following you. 5. She doesn't comment when you pick up junk or read a magazine. She does talk about a few things you do, but not every time it happens and may only say something about it once (she comments once in awhile about the player taking radiation damage, comments about some killed enemies, some clothing items you or she are wearing, your rank, when you heal her, etc). 6. She has options so you can tell her to get out of her default outfit, get out of Power Armor and to put her default outfit back on again. 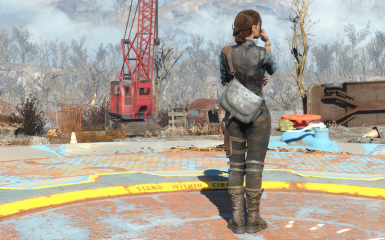 If you remove her bag from her inventory it will not be restored when you re-equip her default outfit in dialogue. If you unequip her bag she loses 25 pounds of carrying capacity. Reequipping it restores that. 7. If you are sneaking she will not say general chatter or combat chatter. She will deliver scripted quest and one-time location lines whether you are sneaking or not. Heather will tell you about her bunker at Wildwood Cemetery when you get to 250 affinity points with her and you'll get a quest marker for its entrance. The bunker is located in the broken down house closest to where you found Heather. There is a hatch on the floor up against the middle wall. See mod images for pic of exact location. This is Heather's house littered with items that fill in her backstory. It is usable, has workbenches that share inventory among themselves, a bed, etc, but it is not a settlement/workshop for the player to redecorate and make their own. It's her house and she returns here if fired after 250 affinity points. Heather's Cheat/Debug terminal is craftable in the Power > Misc category of the workshop menu.Players can do the following in the terminal:a) Set stages in Heather's quests.You can "cheat" your way through quests to avoid boring replay, set a stage that has glitched in your game, etcb) Hire Heather for the first time from the terminal location.c) Turn on Fast Travel to the bunker map marker.d) Unlock the bunker.e) Once Heather has been hired you can remotely access Heather's settings options in the bunker terminal. ***DISCLAIMER*** Because this terminal exists to let players cheat through the questor to debug problems there may/will be times when Heather will talk about things you haven't done with her because those moments are triggered by quest stages, affinity point totals, etc. you've set in the terminal. I've tried to prevent this for bigger moments (you shouldn't have to do conversations with Heather, for example, that you've skipped through in the terminal), but she may deliver a chatter line, etc at some point that references something you didn't actually do with her because you skipped it via the terminal. Those things will remain. I don't consider them bugs but the price you pay to cheat or the unfortunate side effect of having to use the terminal to get through some part of the mod that was glitched. 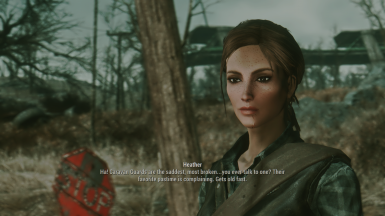 DOES HEATHER HAVE A UNIQUE BODY AND DO I NEED ANY OTHER MODS TO GET HER LOOKING LIKE YOUR IMAGES? FACE:Heather does not use unique face textures and will use whichever face textures you have installed in your game for female NPCs. The best mod images were taken by Elianora and she uses Valkyr Female Textures, however there is also a picture there of Heather with vanilla textures. BODY:She is set up with her own body so that, no matter what you are using in game, she is using the CBBE nevernude, curvy body. IF YOU DO NOT HAVE CBBE installed in your game the back of her neck will have an odd discoloration. The CBBE esp fixes that problem. It's in a separate download because I didn't want the main Heather mod to be tagged as adult. 1. Better Companions by techprince - DO NOT SET UP A PROFILE FOR HEATHER USING THIS MOD. IT WILL BREAK HER AI. THE TWO MODS CAN COEXIST IN YOUR LOAD ORDER YOU JUST CANNOT USE IT SPECIFICALLY ON HEATHER. Most common issues are addressed in the stickied comment at the top of the mod thread.Other Issues:1. Just like the vanilla companions, Heather won't always do what you tell her to do via the command menu. She is no better at navigating in the gameworld than the vanillas. If you tell her to go sit in a chair, hack a terminal, sleep in a bed, etc there is always a chance she will say she can't when there is no visible object preventing her from doing it. It's a FO4 thing.2. Heather may follow you into the Kellogg brain Memory Den scene. It's never happened to me, but if you tell her to wait before you go into the pod that should prevent it from happening.3.When you use the dialogue menu option to have Heather reequip her default outfit it will remove every other thing she is wearing. That's because unequipping only those slots her default outfit actually fails to remove her outfit so I had to unequip everything to get it to work at all. Be sure to delete the previous version before you install the new one. See warnings below if you're current gamesave has a pre-v1.0 version in it and you intend to keep playing that gamesave. Once you've installed the update you need to dismiss and rehire Heather. That will set up what's needed for a couple of changes. If you intend to continue playing fully uninstall the previous version and then install the new one. GAME BUG: MAGIC EFFECTS TAKEN AWAY FROM NPCS AND HOW TO MINIMIZE THIS ISSUEWhen you equip an item on the NPC(clothing or weapon) their current magic effects are removed. Those effects return after you go through a load screen. I recommend, if you want to change Heather's weapon, clothing, equip a hat on her, etc that you do it right before you go through a load screen to limit the time she's without these effects. I tried several scripting solutions to solve/fix this issue and was unsuccessful. So, doing unequipping/equipping stuff right before a loading screen is the best advice I've got right now. THANK YOU SO MUCH! YOU WENT ABOVE AND BEYOND MY WILDEST EXPECTATIONS!I had an amazing group of people helping me to get Heather ready for release. They had Heather for about six weeks and she went through quite a transformation over that time as I continued to polish the mod while they tirelessly tried to break things and find what I’d done wrong. If you run into one of them in a forum please give them a kudos for the hard work they did.